We got this huge piece of brown paper in our last box from Amazon and it just seemed perfect for making into wrapping paper. I have been wanting to do some Fall apple printing so these two just seemed like a perfect match. The other afternoon, I took the paper out back and stretched it out in our backyard, pinning down each end so it didn't blow away. I then took a large apple from our kitchen and cut it in half. I let the girls select the colors, the Bee selected white and the Bean picked red. After pouring the paint onto plastic plates, I showed the girls how to dip the apples into the paint and press it down to create a print. The Bee took off stamping all up and down the long paper. The Bean did a little stamping but mostly just enjoyed getting messy! Our finished paper looks awesome and I can't wait to wrap our first present with it. This is a great idea! 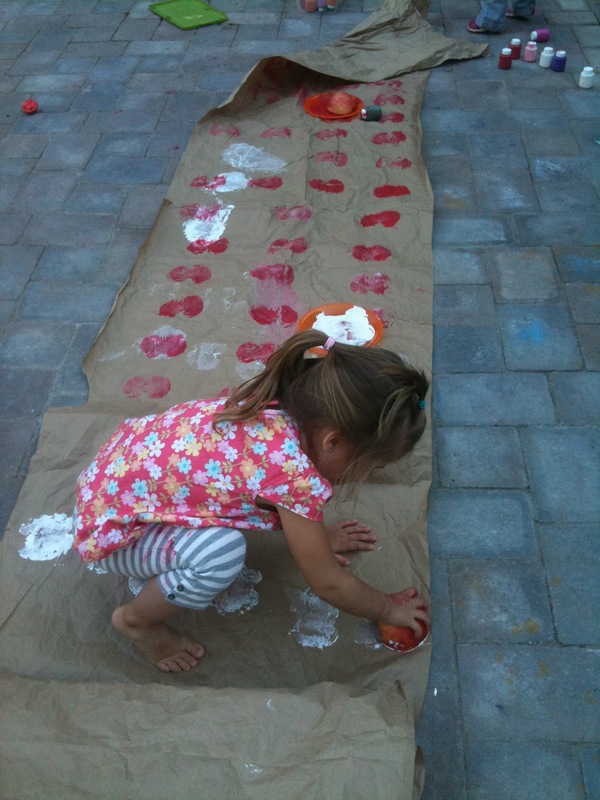 When I worked in childcare we would make apple prints on paper but I love it as wrapping paper.